With smartphones becoming commonplace and new mobile devices such as tablets skyrocketing in popularity, the interest in mobile learning has begun to heat up as well. Many organizations see the promise of mobile learning, but actual implementations are still rare. 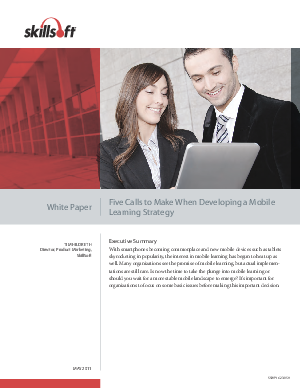 Is now the time to take the plunge into mobile learning or should you wait for a more stable mobile landscape to emerge? It's important for organizations to focus on some basic issues before making this important decision.